2016 Ford F-550SD XL DRW 4X4 DIESEL DUMP TRUCK CARFAX One-Owner. Clean CARFAX. 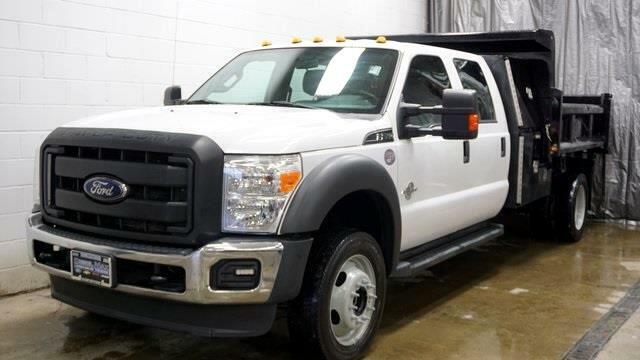 4D Crew Cab, Power Stroke 6.7L V8 DI 32V OHV Turbodiesel, TorqShift 6-Speed Automatic, 4WD, 4.88 Axle Ratio, 4-Wheel Disc Brakes, ABS brakes, Air Conditioning, AM/FM Stereo w/Digital Clock, Dual front impact airbags, Dual front side impact airbags, Dual rear wheels, Front Center Armrest w/Storage, Front reading lights, GVWR: 18,000 lbs Payload Package, Outside temperature display, Passenger vanity mirror, Power steering, Rear reading lights, Split folding rear seat, Tachometer, Tilt steering wheel, Traction control, Variably intermittent wipers. Specializing in all makes models of trucks both diesel and gas. We have vehicles that no body else does. Please call us directly at (330)765-1200.